A critical part of measuring absolute irradiances during flight is to track changes in the prism transmission as the instrument is exposed to increasing amounts of extreme ultraviolet radiation throughout the life of the mission. To account for this, two measurement modes are used to track these changes. The two spectrometers are used at different duty cycles. The working spectrometer acquires spectra on a daily basis, but the second spectrometer is used, in the same operating modes already described, on a once-per-month duty cycle. Comparison of the spectra taken on these different duty cycles give a measure of the overall system degradation between the two spectrometers. Along with the side-by-side comparison of the two spectrometers, a direction prism transmission measurement has been developed. 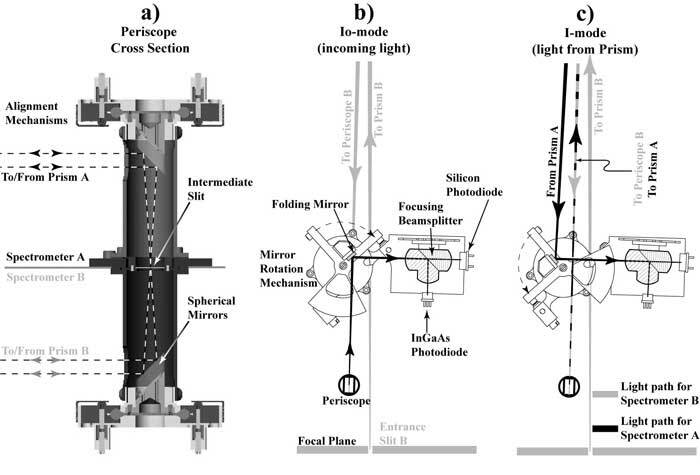 The two SIM spectrometers are coupled with a periscope that has two optical properties, which are 1) that it images the entrance slit at an intermediate slit between the two spectrometers, and 2) that it images one prism onto the other. Light from one spectrometer is used as a monochromator to measure changes in the other spectrometer’s prism transmission. 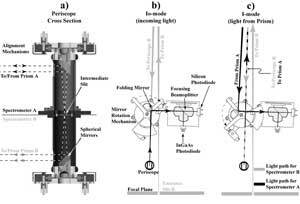 A separate mirror rotator/light detecting system allows the intensity of light to be measured before and after it passes through the prism. The ratio then gives a measurement of the transmission of the prism. This prism transmission measurement will occur on a monthly basis throughout the lifetime of the mission. Other measurement modes include field-of-view mapping of the instrument to track changes in the responsivity of the spectrometer as a function of time. This maneuver is performed every 6 months. Cruciform alignment maneuvers are used to track possible changes in solar pointing over time. An ESR scan mode is also used to measure the solar spectrum between 1.6 and 2.4 µm to extend the operation of the instrument into the infrared.